ProMow is a distinguished manufacturer of reel gang mowers. The company was founded by Doug Short, a man with a large lawn, and not enough time. Doug arranged 7 reels on a frame and pulled the contrption using a lawn mower tractor. His invention worked so well, soon the neighbors were beating a path to his door, asking for similar machines. Over time, his company expanded, and now serves the entire United States as well as many countries abroad. ProMow reel mowers are well build machines, with reels that flex on the frame, allowing for mowing uneven terrain, such as ditch banks. The reels are equipped with ball bearings, and a sharpening kit is available from the manufacturer..
ProMow reel mowers frames all feature a patented 1 1/2 inch tubular frame, with a durable powder coat finish. The maximum cutting speed should be considered 4 MPH. The Pro Series 3 gang mower has 3 cutting reels mounted on a frame that flexes to meet the demands of uneven terrain. Total width of cut is 4”1”. Cutting height varies from 1 1/2” to 2 1/2”. This unit requires 7HP to pull, and will cut about 2 acres per hour. Count on spending $995.00. The Flex 58 gang mower has 3 cutting reels mounted on a frame that flexes to cut areas around culverts and roadsides. Each reel has been upgraded to 6 blades. Total width of cut is 4’10”. Cutting height varies from 5/8” to 2 3/4”. This unit requires 7HP to pull, and will cut about 2 acres per hour. The price is about $1,595.00. 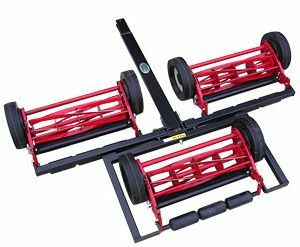 The Gold Premium 3 gang mower has 3 cutting reels mounted on a frame that flexes. Each reel has 6 blades. Total width of cut is 4’10”. Cutting height varies from 5/8” to 2 3/4”. This unit requires 7HP to pull, and will cut about 2 acres per hour. Count on spending a little extra for this machine - $1,975.00. The Pro Series 5 gang mower has 5 cutting reels mounted on a frame that has the standard flex feature. Each reel has 5 blades. Total width of cut is 6’10”. Cutting height varies from 1 1/2” to 2 1/2”. This unit requires 10HP to pull, and will cut about 3 acres per hour. Count on spending for this machine - $1,250.00. The Gold Premium 5 gang mower has 5 cutting reels mounted on a frame that flexes to cut areas around culverts and roadsides. Each reel has 5 blades. Total width of cut is 8’1”. Cutting height varies from 5/8” to 2 3/4”. This unit requires 12HP to pull, and will cut about 4 acres per hour. The price is about $2,995.00. The Pro Series 7 gang mower has 7 cutting reels mounted on a frame that allows the outer reels to fold up for easy storage. Each reel has 5 blades. Total width of cut is 9’8”. Cutting height varies from 1 1/2” to 2 1/2”. This unit requires 10HP to pull, and will cut about 4 acres per hour. The price for this very efficient machine is $1,595.00. The Gold Premium 7 gang mower has 7 cutting reels mounted on a frame that flexes to cut areas around culverts and roadsides. Each reel has 6 blades. Total width of cut is a whopping 11’4”. Cutting height varies from 5/8” to 2 3/4”. This unit requires 12HP to pull, and will cut about 5 acres per hour. The price is about $3,795.00. For those customers looking for an exceptional machine, the ProMow reel mowers are for you. The company simply does not sell a cheaply built unit. These machines are built to last, and to satisfy the needs of the discriminating homeowner.